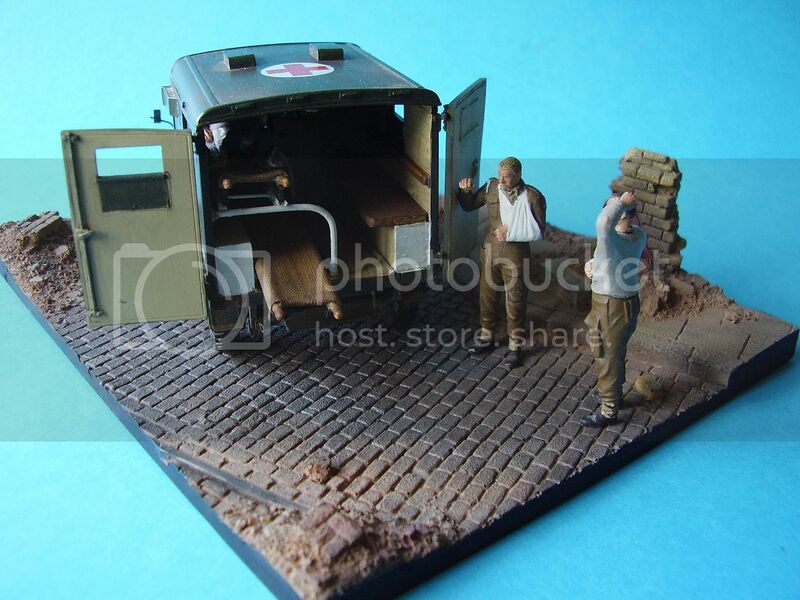 Following on from the recently released figure set of the 25pdr Gun Crew and the British Soldiers in Belgium, Resicast have just released another three figure set, this time wounded and captured paratroopers from Operation Market Garden. 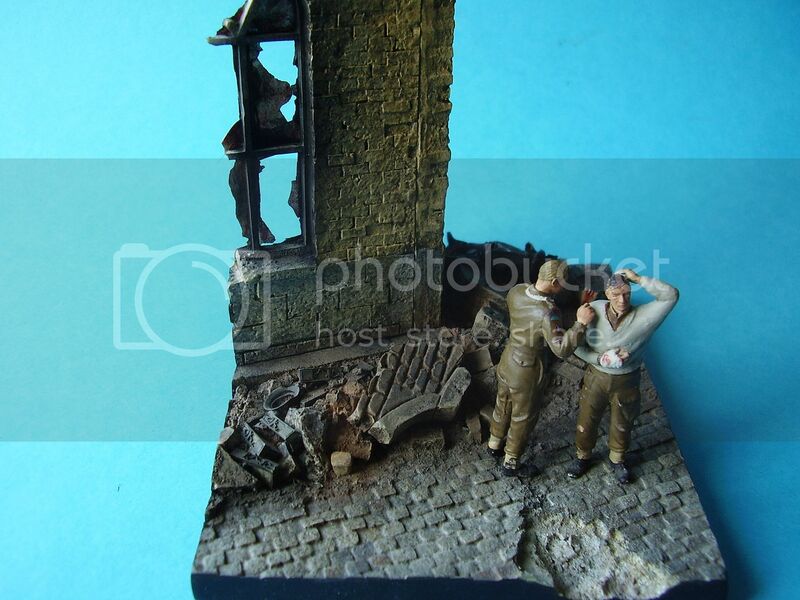 The set is based on a picture taken in Oosterbeek around the 20th September 1944. They depict British paratroopers being searched by SS Panzergrenadiers in front of Berghege house. The soldiers depicted in the set are Gunner Eric Milner of C Troop, 1st Air Landing Anti Tank Battery (the chap with the left arm in the sling), he had just had his arm bandaged up when the MDS (Medical Dressing Station) of 133rd Field Ambulance was overrun by German forces. The other chap in the jumper is Private Tom Harding of No 11 Platoon, B Company, 10th Battalion. He was wounded on the 19th September and sent to the MDS as a patient..
Gunner Milner went through the search process and then simply walked off and rejoined his 6pdr gun crew at the crossroads without the Germans realising he had gone! He was re-captured on the 24th. Operation Market garden has always been a popular subject area for both Allied and Axis modellers. 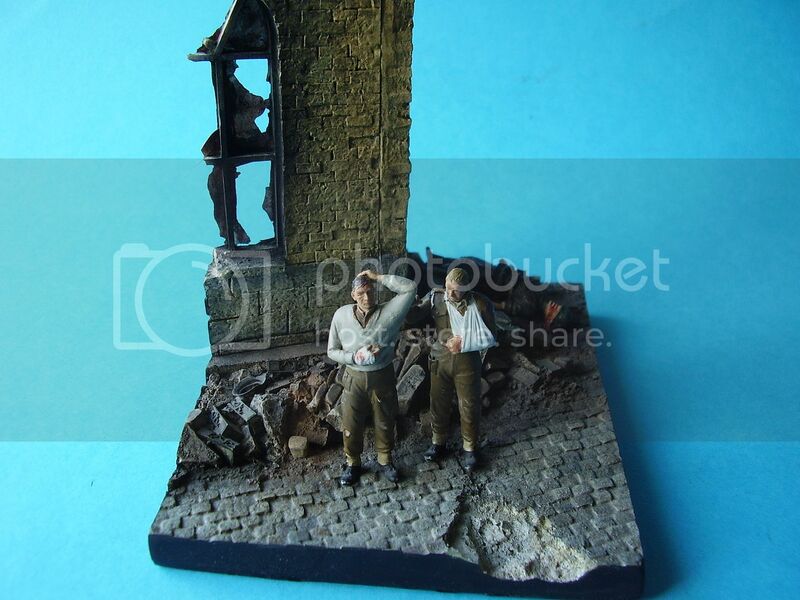 This three figure set is not only of historical interest but it also contains the first British prisoners I can think of, so another first for Resicast. The figures were modelled by Gerard De Troeye. I wrote this review from the first sample of the figures, so I don't have the package art, nor the set of discarded webbing that comes with it. The set is cast in a light cream resin, the quality of the casting is excellent and I could see no damage or cause for concern on the figures. Clean up is minimal. This is a simple figure of 3 parts; full body, right arm and head. Comparing the figure against the picture I think Gerard has captured the pose perfectly. The figure is dressed in Battle Dress Serge 1940 without the pleated pockets. A small lanyard as depicted in the photograph leads into the top right hand pocket and the figures left arm is in a nicely done sling. The BD trousers have the top front leg pocket open and everything appears to be in good order as regards the uniform. The clothing has nice natural folds and creases, and to complete the uniform a good set of anklets and ammo boots are depicted. The face is a good likeness to Milner showing a somewhat down turned mouth and a look of pain/disgust at being captured. The right arm is a separate item and is partially raised allowing the search to take place. The hands are well depicted. Again a simple figure of three parts; whole body, left arm and head. The pose matches the photograph well, although in the picture Harding’s legs/feet appear closer together. The figure is dressed in Paratroopers trousers that were introduced in 1943. These had modifications to the normal BD trousers, a larger expandable map pocket with a wider rectangular flap, a dagger pocket on the side of the right leg and two pockets for wound dressings on the buttocks of the trousers. The details of all these elements are present on the figure including the two studs and central plastic button on the map pocket, the two studs to close the dagger pocket and the 3rd field dressing pocket on the front upper leg. There is a small tear in the right hand trouser leg. On the upper torso the figure wears a cardigan over an open necked flannel shirt. The cardigan was a khaki colour although the one in the picture looks much lighter. Again detail matches well to my reference of the original garment. The right arm which is moulded to the body displays a bandaged hand which is nicely done and again the hands are nicely depicted. The head is a fair representation of Harding who appears to have quite a frown on his face and the left arm is designed to sit up and over the head. Both are excellently represented and give a striking resemblance to the actual soldiers. 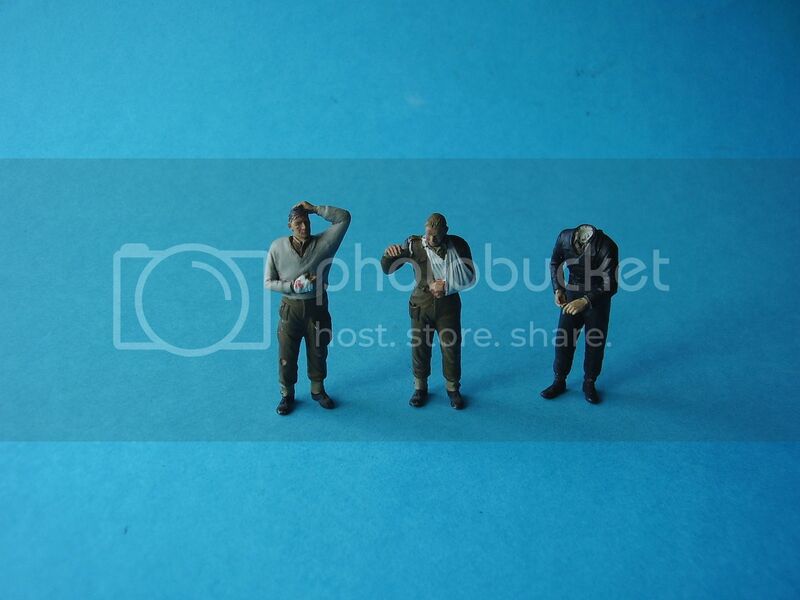 The clothing, poses and overall body proportions of the figures are spot on. Standing at 43 to 44mm from heel to shoulder these are a perfectly acceptable height. There is a very tiny seam to clean up on Harding’s left leg , but other than that I couldn’t find fault with anything I looked at. A change of head would give you alternative options, Milner’s Battle Dress figure being easily used as an infantryman, gunner, signaler or whatever you choose. The 3rd figure of the set represents an SS Panzergrenadier. Again a simple standing figure of 4 parts; the body cast as a whole, arms and head as separate items. Again the figure is well sculpted and cast. Dressed in appropriate uniform for the period the figure wears full equipment, belt and yoke are nicely done, as is the food bag moulded to the left hip. I have limited references as far as German uniforms go, but what I’m looking at seems correct to me. To add to that you get an MP 40, pistol holster, water bottle, magazine pouch and map case, all of which have good detail. The head has good facial detail and a good representation of the German helmet. There was a small air hole on the RHS of the chin but easily fixed with some CA glue or a little Milliput. The arms and hands have good detail. I’m not an expert on German uniforms but this figure looks very acceptable, with nice folds and creases in the uniform and with overall excellent detail, it should paint up very well. I believe a small set of additional equipment is provided as discarded webbing and a helmet for the paratroopers along with a Mk V Sten Gun and magazine. These weren’t in my early sample so I can’t comment on them, but I have included one of the news release pictures that features these parts. A historically interesting set of figures, excellently sculpted and cast. These should be of interest to both figure painters and diorama builders alike. The release photographs don’t, IMHO, do the set justice, but I have included some at the end of the review for reference. Being set in a specific time and place could have been a disadvantage but with new heads on the British figures these could be used just about anywhere in NWE, or probable Italy and N Africa too, with a little imagination. Good body proportions and excellent detail plus the historical context should make these a worthwhile buy and addition for anyone's collection, particularly those with an interest in Operation Market Garden. The original photograph shows Harding’s jumper almost as an off white/grayish garment. Standard paratrooper jumpers were Khaki in colour, so I don’t know if Harding is wearing a well washed and faded out one, or this is simply a trick of the light. Either way it provides an alternative finish to the standard kit. Highs: Beautifully sculpted and cast, capturing a moment in time.